The new year is off to an exhausting start. Between Tom Brady going back to the Super Bowl, hamberders, and people not being cool when you want to drink wine out of a Pringles can you'll be forgiven if you need a double dose of caffeine to finish out the week. Also, there's the genuinely serious ongoing government shutdown. If you're feeling the need for a free pick-me-up, Starbucks' "Happy Hour" today could be the solution. On Thursday, January 24, Starbucks will bring back its popular "Happy Hour" with a buy-one-get-one-free (BOGO) offer on espresso drinks and Frappuccinos, size grande or larger. The deal is good from 3pm to close at participating locations all across the country. When you stop in, you can use the deal for hot or cold espresso drinks or any Frappuccino (except for those liquid-y pre-packaged ones). Sure, you'll need to buy a drink in order to get the other one for free, but maybe look at it this way: You'll be able to get your usual drink and have the chance to try the coffee chain's new Cinnamon Shortbread Latte, which landed on the menu earlier this month with less risk. Starbucks describes the sweet drink as "cookie butter in a cup," and it's available as both an espresso drink (iced or hot) and blended as a Frappuccino. Either way, the drink features “notes of brown butter and vanilla" and comes topped with cinnamon and nutmeg. Maybe you just need double the espresso. Maybe you have an annoying coworker who keeps bugging you about that time you needed to borrow a dollar at lunch. This is a good time to repay them with interest. 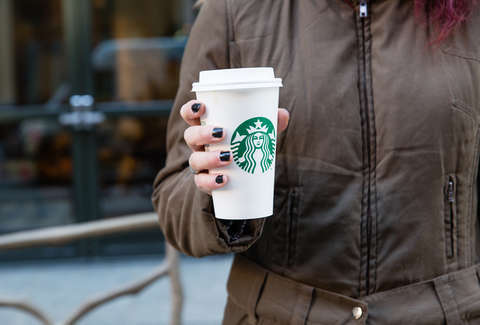 Whatever the reason, here's how you line up your BOGO drinks: If you're a Starbucks Rewards member, the discount barcode will be sent to your email and/or mobile app. Flash it to the cashier, and you've got the coffee equivalent of a Doublemint Gum commercial. The other option is to RSVP for the promotion at the Starbucks Happy Hour site. If you do the latter, you'll be signing up for email alerts for future "Happy Hour" promos. Caffeine can't make the day better by itself, but it can certainly improve your ability to weather the storm.